'The Braes', the Herbert Lee Pratt estate designed by James Brite of Brite & Bacon c. 1912 in Glen Cove. Pratt was the chairman of the board of Standard Oil of New York. In 1930 Herbert was charged $16,000 for having 240 cases of champagne (costing $25,000) smuggled into the country and sent to his home (which he was forced to surrender to the government). The house has been the Webb Institute for Naval Architecture since 1947. Click HERE for more on 'The Braes'. Click HERE to see 'The Braes' on google earth. 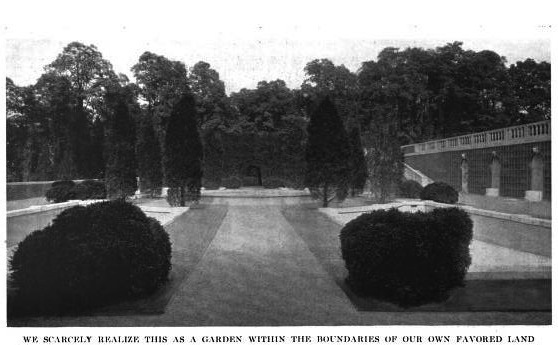 Pictures from American Country Homes of Today, 1915. While today, with its three great Sound size terraces bare, the Braes appears top heavy and ungainly, these photos give some idea of how much more appropriate it looked in its heyday with its immediate environs thickly landscaped and planted. Herbert Pratt is the most interesting of the Pratt brothers. Henry James was intrigued enough by him to have based a character, Gabriel Nash, after him. Pratt was a noted collector of American and English portraits and minatures as well as Shakespeare memorabilia. Shortly after building the 2nd Braes, he beat out William Randolph Hearst to purchase the famous Rotherwas Room from the art dealer, Joseph Duveen. Initially installed at The Braes,the room was left to Amherst at Pratt's death and is currently installed at the Mead Museum there. No layabout, Pratt was also a highly succesful businessman, rising to Chairman of the Socony-Vacuum Oil Company (previously Standard Oil of New York, subsequently Mobil and now Exxon-Mobil) Mrs. Pratt was no slouch herself- the former Florence Gibb, she was an active campaigner for woman's sufferage,the first woman Regent of New York State and instrumental among Republican woman in agitating for the repeal of prohibition during the late 1920's and early 1930's. Too little is recalled today about this truly unusual and much to be admired couple. So fascianting I would love to read a biograpy of Pratt! Great information Thank you for sharing. I have a fascinating interview with artist Robert Anders up on my site. magnus hit the nail on the head. the downfall of these reused places is first the total disregard of landscaping and second, the disregard of scale and period when adding more structures (see dilletantes article on the searles methuen house). this is a masterfully large and impressive house both inside and out and its nice it survived but it looks like the modern tract houses in this neighborhood. a house sitting in the mniddle of nothing - not a tree, a shrub or a flower. also, it looks like they have no regard for statuary either as all the wall niches are boarded up with plywood - how attractive. 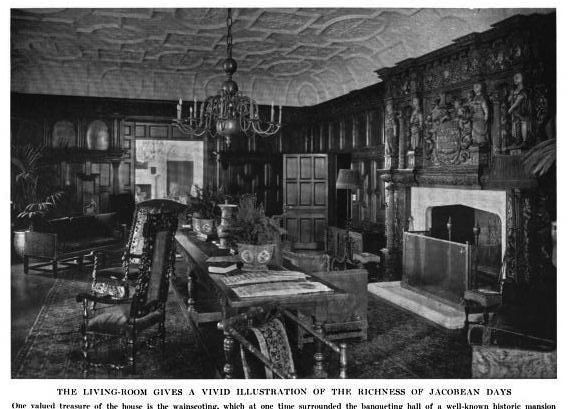 In the 1915 photos, the Rotherwas panels grace a room described as the Living Room. 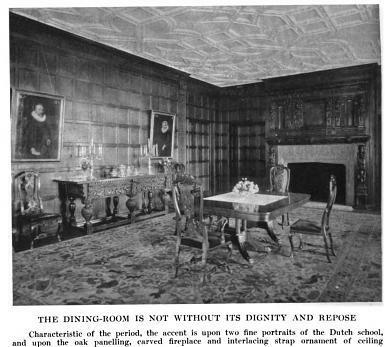 Interesting to note that there is a photo of the room when installed at The Braes (but clearly many years later) on the Amherst website. It is clearly configured as a dining room. Here's the full link to the Rotherwas Room. 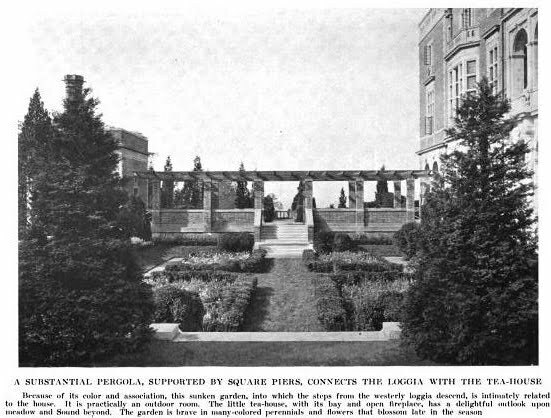 By the way, one of the photo captions in this article mentions that the central pool of the water terrace sported a bronze centerpiece of four figures supporting a large bowl. The centerpiece does not appear in the previous photo that gives a head on view of the central pool. Perhaps it had not been installed yet. 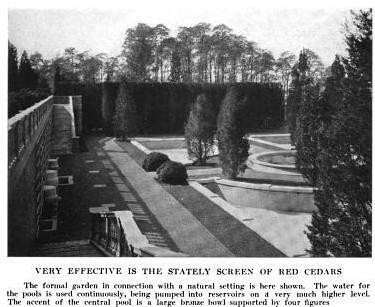 I am told that when Webb Institute purchased The Braes, the institutional use of the house required the installation of a substantially larger septic and sewage system and that this was installed under the water terrace, requiring the removal of the basins (how the mighty have fallen). I was also told, anecdotally, that the central fountain figure was purchased by an town or villiage on the South Shore of Long Island (name unknown), and now graces a public square there. Anyone know for certain what year the Bacon & Brite partnership was dissolved? I've seen a reference to 1902. I've come across two sources that say 1903.